La Cucina di Ciro, set in a delightful old house off 7th Ave Parktown North, and Osteria Tre Nonni in Grafton Ave Craighall Park (5 minutes from Liz at Lancaster Guesthouse), have both had their membership renewed for the 2012 American Express Platinum Fine Dining Awards. The prestigious programme has strict criteria relating to quality, cuisine, decor, service, creativity, ambience, wine list and acceptance of American Express Cards. The judges of the 2012 awards were the well-known Johannesburg-based writer and food critic, Victor Strugo, who has been a judge since the inception of the programme in 1999, and Cape Town-based ‘foodie’ Tamsin Snyman. These 2 restaurants are amongst 78 around the country who meet the strict standards of the programme. 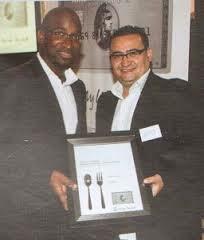 Congratulations to them both – more fine dining expriences on offer in the Parks area of Joburg.